Notes: 1. 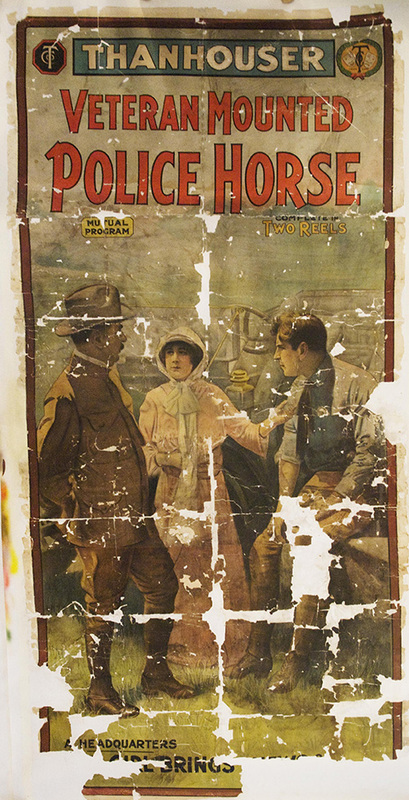 The title of this film was given interchangeably as The Veteran Police Horse and The Veteran Mounted Police Horse in Reel Life, August 30, 1913. 2. In some notices the film was described as "educational and drama." "'There is little in life for a horse,' said the older animal sadly. 'I have seen it all and I know what I am talking about. Why, I was on the police force.' Then, as the young colt listened with interest, the old horse told the story of his life. 'When I was young,' he said, 'my strength and beauty attracted favorable notice, and I was purchased for the New York Police Department. They had a university for police horses down at Jamaica, Long Island, and the course is very severe. After receiving my diploma, I was turned over to a member of the mounted squad. If I wanted to I could tell you the name of the society woman my master saved from injury in a runaway. As the years passed, I grew feeble and was too slow to remain on the force. They took off my uniform and I was sold to a hackman. He had some good qualities, but not many. After a while the automobiles ruined his business, and he retired. My next owner was a huckster, a cruel taskmaster. Often I wished that I could lie down and die, for I never knew that a horse could be so miserable as I. He was especially brutal one day, and I thought that the end had come. Then a mounted policeman dashed up, and sternly rebuked him. I looked at my preserver with gratitude and recognized my first master. He knew me, too. He told the huckster that he wanted to buy me, and he did. Then he led me away to this place, telling me I would never have to work again, but would be cared for as long as I lived.' The old horse stopped, turned, and saying 'Here's my old master now. He always comes on his day off,' dashed away to a man in uniform who approached from the farm." "An especially interesting subject is present in this film, which with an interesting story interwoven, shows the discipline and drill to which the policemen and their horses are subjected. The pathos of the story comes when the horse, grown old, has to be sold and falls into cruel hands, from which he is bought back by his former master and placed in green pastures surrounded with every luxury that a horse could wish for the remainder of his natural life." "A sort of 'Black Beauty' film story, in two reels, featuring an old police horse turned out to pasture. The horse tells its story to a young colt, the incidents, some stirring and others pathetic, being presented on the screen. This will have an especial appeal to lovers of animals, of whom there are many in every audience. The sidewise jerking of the camera added nothing to the picture and was very hard on the eyes of observers of the film." "An old horse turned into the farm for the rest of his life to live in peace tells the story of his life to a young colt. This story, in its telling, has several episodes and incidents, such as the training of the police horses - which appears to be the real thing - that are highly interesting, and it is only a pity that more care was not exercised in building a better story. The story is disconnected, and arrives at the conventional end when the old master finds the horse that he was forced to sell years before, being ill treated, buys him back, and turns him into green pastures to live out his remaining days." No release due to two-reel release of September 2, 1913.